At the age of eight, Karin Gerber-Bartel fled her home in Prussia as a refugee. She remembers the harrowing journey and what it was like to live in a refugee camp. MCC relief supplies brought her family joy then, now she makes comforters to pass on that feeling to other displaced people. MCC representative Naomi Enns visited Karin in March to hear her story and learn what motivates her to give back. Naomi Enns is MCC’s representative for West Europe together with her spouse Doug Enns. They traveled to Switzerland to meet with Karin Gerber-Bartel who has made comforters for MCC for several years. The Ennses previously served as MCC representatives for Syria and Lebanon. On a Sunday in April, I drove to a small rural village called Tramelan in the mountains of Switzerland. 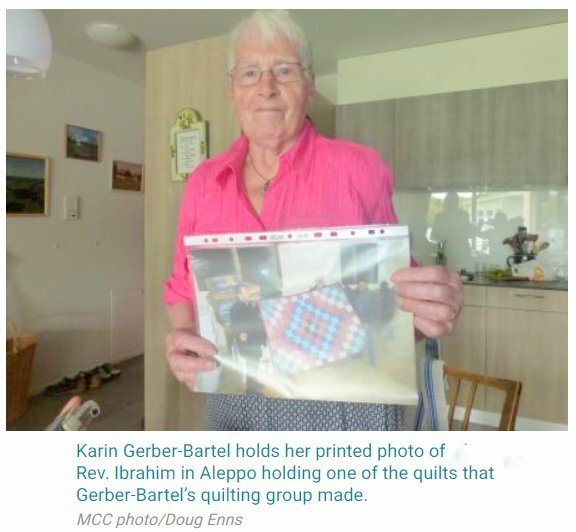 My husband Doug and I were driving to meet Karin Gerber-Bartel, an 81-year-old woman who makes comforters for MCC after having experienced life as a refugee herself. I was curious about the story that was waiting to be told, how one woman’s own refugee story would impact her desire to help others displaced in countries at war. Karin has been part of the Mont Tramelan quilting group for five or six years. The women get together once a week in an old rural schoolhouse to make comforters they donate to MCC for distribution. Fleeing violence is an experience that’s familiar to Karin. She was eight years old in January of 1945 when she fled her home in Unterberg, Prussia on a horse and buggy with her mother, siblings and grandparents. First, they traveled towards Danzig but the violence followed them on the road. “One day we were outside, and a bomb fell on us,” she told us. “I was eight years old. My finger, hand and hip were wounded by shrapnel from it. My three-year-old sister was with me.” Her young sister died from the injuries of the explosion. Today Karin still carries the scars from the bomb, she reached out her left hand to show me her fingers, the tips are missing, and they still bear the old scars. Her family desperately wanted to get away from the fighting, so they got on a small boat without knowing where it was headed. “We had no idea where we were going—we just wanted out of there,” she told me. That boat took them to a larger ship in the middle of the Baltic Sea, eight-year-old Karin climbed a ladder up the side of the bigger ship which took them to Denmark. They lived in Denmark for the next three years in five different refugee camps without her father who was a prisoner of war at the time. It was while living in those camps her family received relief supplies from MCC; it was a big joy every time Karin says. She remembers the “camp cake” her mom would make with the food they received, they would invite others to come share the cake and have some coffee. “I remember we made it, the coffee, very thin like water so it would last,” she told me. In 1953, reunited with her father, her family moved into a home in Espelkamp built by participants in MCC’s PAX program, an alternative service option for people who didn’t want to serve in the military. When I asked her how it felt to see a photo of her group’s comforter being received in Aleppo and distributed by the MCC partners there, she was excited, she said “It feels so good, so nice to pass it on. I have learned in life that what we have we don’t waste and we must share …we are called to give back.” That is part of why she participates in the comforter group. There are approximately 15 quilting groups that meet throughout Switzerland, Germany and Netherlands; together they made 364 comforters in 2017. Those comforters are then shipped around the world to support people displaced by conflict. MCC, with the assistance of West European Mennonites and others, is sending another shipment to Syria filled with comforters, relief buckets and school kits. It was packed together by representatives from many countries during the Mennonite European Regional Conference in Montbéliard, France in May. As I listened to Karin share graciously from the history of her life and deeply of the losses she has experienced, I could only think to myself, war is a terrible thing. It separates people from that which they love, it forces people to flee homes, friends and family, it leaves many lost. Yet, I also felt the glowing embers of resilience in the human spirit, one that had survived her own terrors of life as a refugee and now passes comfort on to others. And I thought to myself, we have been given much. In the end, life is about giving back. About being faithful and focusing on what matters most.